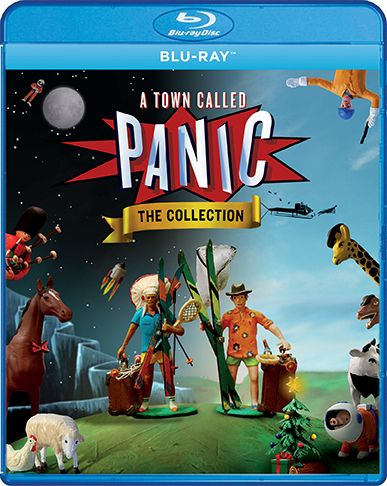 Los Angeles, CA – A Town Called Panic: The Collection, two award-winning specials from the directors of the zany feature film A Town Called Panic and the co-directors of the Academy Award®-nominated Ernest & Celestine, is receiving a Blu-ray™ and EST/VOD release from GKIDS in collaboration with Shout! Factory, on December 19, 2017. Bonus features include all 2 hours of the A Town Called Panic shorts that aired as a series on Nicktoons, and The Grey Room, a new short film by same directors. Cowboy and Indian are always up to some harebrained scheme, with Horse left to clean up the mess. In Christmas Panic, their out-of-control antics lead Horse to call Santa and cancel the presents. But the boys figure they can still save Christmas… if they break into their neighbor’s house to steal his yule log! In Back to School Panic, a class quiz promises a fantastic prize, but only Pig knows the answer. Cowboy and Indian use a special shrinking potion to sneak into Pig’s brain, where they discover a bacon-packed world that is more than they bargained for. A Town Called Panic: The Collection received a 50+ theater theatrical release in fall 2016 as part of Arthouse Theater Day, a day of unique programming at independent cinemas nationwide. Christmas Panic! and Back to School Panic! won audience awards at the New York Int’l Children’s Film Festival, the largest festival for kids and teens in North America, the Jury Award at Annecy Film Festival, as well as additional prizes at numerous festivals around the globe. GKIDS is a producer and distributor of award-winning feature animation for both adult and family audiences. Since 2010, the company has scored an astounding nine Best Animated Feature Oscar nominations – with The Secret of Kells in 2010, A Cat in Paris and Chico & Rita in 2012, Ernest & Celestine in 2014, The Tale of The Princess Kaguya and Song of the Sea in 2015, Boy and the World and When Marnie Was There in 2016, and My Life as a Zucchini in 2017. GKIDS also handles North American distribution for the famed Studio Ghibli library of films, one of the world’s most coveted animation collections with titles Spirited Away, My Neighbor Totoro, Princess Mononoke and others. This fall, GKIDS is launched ANIMATION IS FILM, an LA-based film festival produced in partnership with Annecy International Animation Film Festival, Variety Magazine and ASIFA-Hollywood. The first edition took place from October 20-22 at the TCL Chinese Theater in Hollywood.